1.) How do you hold your fabric? I stitch in hand so I roll the fabric up from the left side and hold the roll with my left hand. (same as Monique). 2) Floss licker? Only when I can't find my threader. 3) How do you thread your needle? With my threader. 5) Are you a needle loser? Oh yeah. And unfortunately my husband's feet usually find them! Ouch!! 6) What fabric do you prefer to stitch on? Belfast linen is my favorite. 7) Bobbins or floss bags? Both and I also use Thread Drops. 8) Are you a scissors collector? Yes, I have way too many! 9) Do you do your own framing, and if so, do you lace or pin? I used to. I pinned. 10) Are you a floss floozy? Yes, but I'm actually more of a Fabric whore! 11) Silk? Yes, I love silk! 12) Railroader? Only when it seems like my thread is getting twisty and it looks like it needs it, but not every stitch. 13) Are you a pattern or designer snob? It depends. If I know a designer has copied another designer that I like I won't buy their patterns. I don't think that's right. 14) Do you get antsy when you give someone a stitched gift? Yes, I always worry that it's not good enough. 15) Have you reached S.A.B.L.E.? I think I reached it years ago! 16) Do you wash your projects? Only if I'm not using hand-dyed threads or fabric. So I guess the answer would be no because I'm always using one or the other lately. I'm not doing anything today. Today is a pajama day for me. I took a shower and put on clean pajamas! 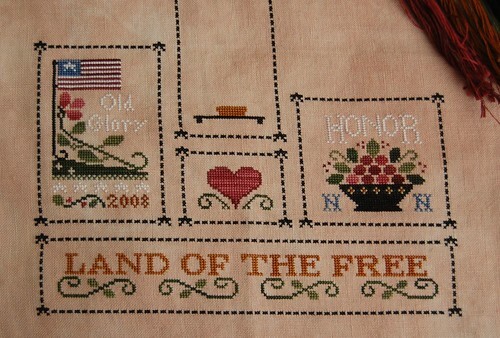 :) I decided to get "Heart of America" back out and I stitched on that a little bit yesterday and today. P.S. Melody still hasn't claimed her prize!! If she still hasn't done so by Tuesday, April 22, 12 pm, I will draw again. If anyone knows Melody - please let her know!! Oh I do hope Melody claims it. What a shame to win such a wonderful prize and then let it just drift away. 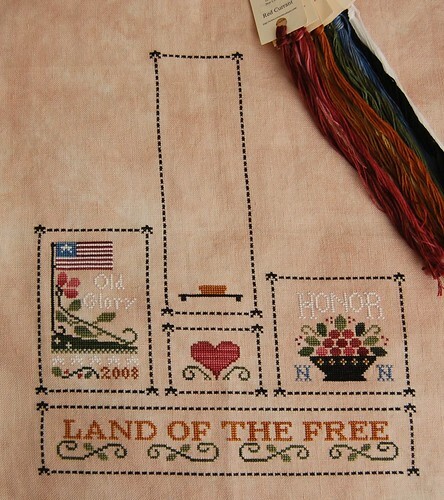 And I think I may need to do "Heart of America" one of these days just watching it stitch up so beautifully for you! Great progress so far. You have been busy kitting up lots of future projects too. Oh, a pajama day sounds marvelous!! Lots of splendid progress and congrats on PJ day. That sounds marvelous. I have "robe" day every now and then. Have fun stitching in your PJs. It sounds so relaxing. I am thinking I may need to buy Heart of America, even though I have sworn off buying anything for the next few months LOL yeah right!! I do hope Melody claims her prize it is such a great gift you gave not to be claimed. Great progress, congratulations on finishin Rose Cottage. I love the No Bees sampler, have it in my stash, looking forward to seeing your progress on it when you make a start. I love how Heart of America is coming along. What is "railroader" and "S.A.B.L.E".......? Nicole, your stitching is always so gorgeous, I love coming here and seeing what all you're up too, you really inspire me! ohhhh you are tempting me with this one! but i wouldnt know what to do with it but im soooo lovin it from your progress! I'm a relatively new cross stitcher and just getting to the stage when I want to purchase a floss storing system. Could you discuss why you use three different methods and what do you think is the best one for beginners?